Here’s how to make a pretty little witchy candle holder out of air-drying clay - perfect for spell candles. When you do candle magic you normally make a wish, light a candle and then let it burn down completely. Obviously, if you use a big candle, you have to wait a long time. Spell candles are like small versions of dinner candles. They are small because they are intended to burn down all in one go in just a single evening – which is what you want for candle magic. The spell candles in the photos are ones I bought from Treadwell's in London and they have an hour-and-a-half burning time. Even if you don't make your own candles, I think it adds to the magic if you have made your own candle holder. Here is how to make one like those in the picture above. 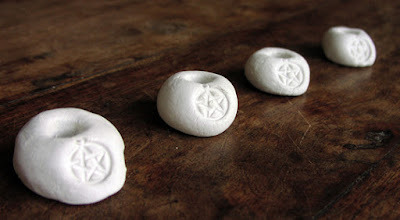 You need some air drying modelling clay, a spell candle, a pentacle charm or pendant and paint in a colour of your choice. Pinch off a suitable amount of air-drying clay from the block and roll it into a ball in the palms of your hands. When it is smooth, plonk the ball of clay down reasonably hard onto a flat surface to make the bottom flat. 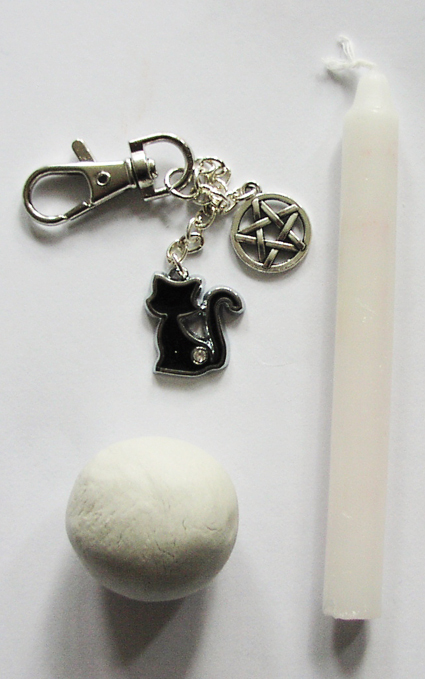 Then, press the spell candle into the top of the clay until it makes a hole about two-thirds of the way to the bottom. Make sure it doesn’t go right through it though. 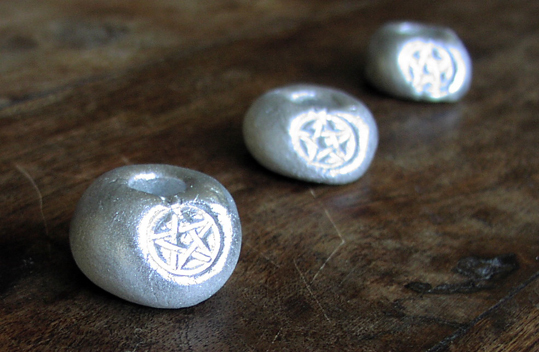 Press the pentacle charm or pendant into the clay to indent its shape. Wiggle the candle around to make the hole in the top a little bit wider, but not too much, then remove the candle. This is so that when it is dried you can insert candles easily. Leave the candle holder to dry for a couple of days. Make sure it is fully dry before painting. The picture at the top shows three candle holders sprayed silver; the picture top right shows a red spell candle in an unpainted holder; the picture bottom left shows a ball of clay, the pentacle charm I used to indent it and a white spell candle; the one at the bottom shows candle holders drying. My book Pagan Portals - Candle Magic is at the printers.